DiSTI offers a one-stop-solution, GL Studio, for all the UI development needs of an automotive OEM. GL Studio transcends the limitations of legacy UI tools by allowing designers a free hand in exploring talent to develop innovative UI prototypes and deploy them into production with ease. GL Studio provides designers with an unlimited toolbox to realize designs in real-time using a robust run-time engine and cross-platform deployment. With this solution suite, designers can iterate quickly and release UI updates faster, thus reducing time to market. It also provides flexibility for a programmer to integrate code into the design framework. GL Studio’s drag and drop features allow those without programming experience to generate and deploy the UI code quickly. The resultant UI can connect with all existing systems inside the vehicle and provide a simplified and accurate input/output interface to manage the in-vehicle experience. 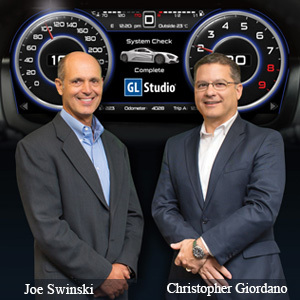 “Driven by the complete control and flexibility offered by GL Studio, OEMs can redefine driver experience and drive brand loyalty with ease,” says Christopher Giordano, Vice President, The DiSTI Corporation. On the reliability front, DiSTI caters to the OEMs’ safety concerns through its pre-certified ISO 26262 ASIL D zero-bug runtime library to handle functional safety-capable displays. Giordano takes pride in the fact that their flexible UI software for automotive companies is the same that goes into developing and managing the instrumentation in aircraft, spacecraft, and life-critical medical devices. The innovative UI solutions company also leverages key partnerships with top automotive suppliers to consolidate hardware and build next generation in-vehicle displays. For instance, DiSTI partners with Tata Elxsi, a global services design and technology services provider for the automotive industry, to build best-in-class user interface solutions. Tata Elxsi wanted to consolidate in-vehicle hardware and create a single robust system that can run multiple Graphical User Interface (GUI) displays. DiSTI provided their inventive UI software GL Studio and extended architectural assistance to build a UI framework that has powerful Human Machine Interface (HMI) solution used for building instrument clusters, heads up displays, and infotainment systems. Further, Jaguar F-Pace, which won the World Car Design of the Year Awards at the New York International Auto Show, has GL Studio as the interface layer for its InControl© Touch™ Pro infotainment system. In the last decade, DiSTI has worked closely with Real-time Operating System (RTOS) providers such as Green Hills, Wind River and QNX as well as chip manufacturers such as Intel, NXP, and Renesas to ensure that GL Studio is efficiently integrated into the latest target systems.